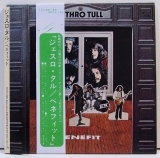 Replica of the UK version of the 3rd Tull album. Includes 4 bonus tracks available on Living In The Past (sort of, Singing All Day, The Witch's Promise, Just Trying To Be and Teacher (Original UK Mix)). Given the style of the previous "Stand Up" (where the inside of the gatefold contained a pop-up version of the band) and the next +1 "Thick as a Brick" (where the albm cover folds out to make a mock newspaper) I suspect that this cover may have been earmarked for similar treatment. It shows a photo of cardboard cut out figures of the band mounted on cardboard supports inside a diarama type stage. The front cover shows the front of each player while the back cover shows the scene from behind. 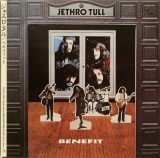 Some US listeners may find this version a little off-putting as it is true to the original release in Tull's home nation (UK). The 3rd track on this re-issue is "Alive and well and living in" (as per the UK release). "Teacher" (the 3rd track on the US release) was never a favourite of Ian Anderson's but can be found as a bonus track. That said, it's not the same version as on the US vinyl. To quote from Tull's site "The UK version [of "Teacher"] on the remastered copy is a very different arrangement with far less flute. 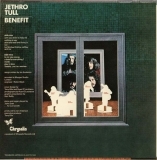 The flute was added to the US release as the record company felt Tull needed a pop single featuring the flute."